Von-Aire Inc. provides an excellent Maintenance Program for all of your Air Conditioning and Heating Unit repairs and service in Daytona Beach, Port Orange, Ormond Beach, Deltona, DeLand, Palm Coast, and neighboring Volusia, Flagler, and Seminole Counties. 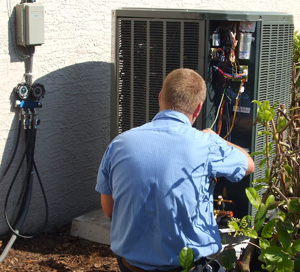 Our Factory-Trained HVAC Technicians strive to provide you with the absolute best service. Contact us today for your free maintenance quote. Your heating and cooling system is a vital part of your home comfort. Yet it is often taken for granted. Much like an automobile, it needs regular maintenance to provide you with the maximum comfort, efficiency and reliability. Our Planned Maintenance Program will take the worry out of maintaining your heating and air conditioning system. The program offers a spring and fall tune-up of your comfort system, discounted air conditioning repair rates for any repairs that may be required, and priority service. Our maintenance coordinator will notify you when it is time for your Tune-up and schedule the visit, so you don't have to worry about it. As a planned Maintenance Customer, it's comforting to know you will have top priority in case your system requires emergency care. Like most things, your home comfort system will last longer if it is properly maintained. A properly maintained system will operate more efficiently than a neglected system. You don't have to keep track of when maintenance is due. We remind you when it is time for your spring and fall inspections and schedule them at your convenience. You know us. We know you and your comfort equipment, and you get a friendly response when you call.